USC is payable on gross income, including Notional Pay, before employee pension contributions. Employers are notified of the specific USC deduction method for each individual employee in the same manner as they are notified about an employees PAYE deductions, i.e. on the P2C file on an employee by employee basis. The Form P45 includes a dedicated section for the return of USC information and must be completed by all employers when an employee ceases to be employed by them. When a new employee commences employment with you, you must capture the USC already paid by the employee as per the P45 issued from his previous employer. The employee records 'Previous Employment' input screen facilitates the recording of the additional USC information from the P45. 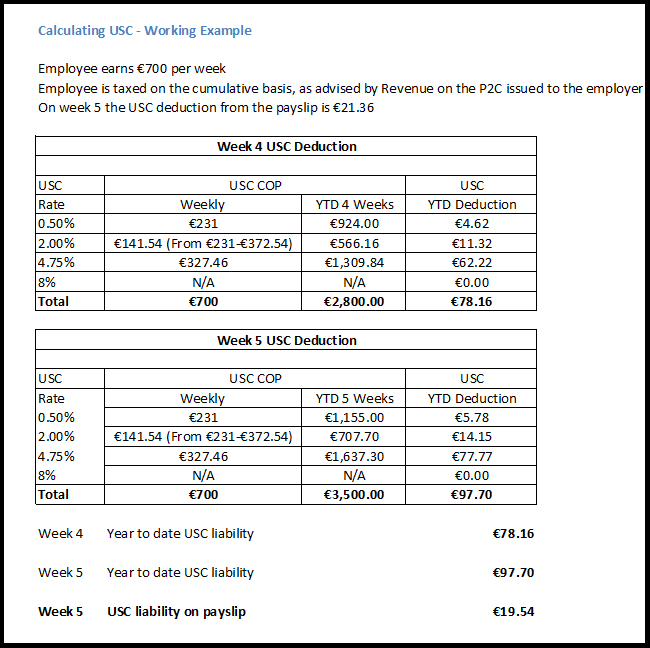 Where the week 1 basis is used, the tax credits and cut off points (both tax and USC) information on the P45 can be used on a week 1 basis but the previous pay, tax, pay for USC and USC deducted should not be used to operate the cumulative system. The previous pay, tax, pay for USC and USC deducted will be notified to the employer on the P2C issued by Revenue. Where Revenue determine that the employee/pensioner’s total annual earnings (from all USC-able sources) will not exceed the USC exemption threshold (2018: €13,000), the USC exemption will be stated on the P2C issued by Revenue. This USC exemption marker is an instruction to the employer/pension provider not to deduct USC from payments being made. Where the employer holds a P2C which does not show exemption and the employee/pensioner advises them that USC exemption applies to them, the employee/pensioner should be instructed to contact their local Revenue office to arrange to have a revised P2C issued. While awaiting a revised P2C the employer should continue to use the P2C currently held. Where a week 53 occurs an additional period of USC threshold is allocated to the employee on a week 1 basis. points are not applicable to an employee. Employees > Select the employee > Click the 'Revenue Details' tab > Tick to exclude the employee from the week 53/54/56 USC concession > 'Save Changes'.